Kim Jong-Un is the supreme leader of the Democratic People's Republic of Korea (North Korea). He is the son of Kim Jong-il (1941–2011) and the grandson of Kim Il-sung (1912–1994). He has held the titles of the First Secretary of the Workers' Party of Korea, the Chairman of the Central Military Commission, Chairman of the National Defence Commission, the Supreme Commander of the Korean People's Army, and presidium member of the Politburo of the Workers' Party of Korea. He was officially declared the supreme leader following the state funeral for his father on 28 December 2011. He is the third and youngest son of Kim Jong-il and his consort Ko Yong-hui. From late 2010, Kim Jong-un was viewed as heir apparent to the leadership of the nation, and following his father's death, he was announced as the "Great Successor" by North Korean state television. At Kim Jong-il's memorial service, North Korean Chairman of the Supreme People's Assembly Kim Yong-nam declared that "Respected Comrade Kim Jong-un is our party, military and country's supreme leader who inherits great comrade Kim Jong-il's ideology, leadership, character, virtues, grit and courage". On 30 December 2011, the Politburo of the Workers' Party of Korea formally appointed Kim as the Supreme Commander of the Korean People's Army. In April 2012, the 4th Party Conference elected him to the newly created post of First Secretary of the Workers' Party of Korea. He was promoted to the rank of marshal of the DPRK in the Korean People's Army on 18 July 2012, consolidating his position as the supreme commander of the armed forces and is often referred to as Marshal Kim Jong-un or "the Marshal" by state media. He obtained two degrees, one in physics at Kim Il-sung University and another as an Army officer at the Kim Il-sung Military University. On 9 March 2014 Kim Jong-un was elected unopposed to the Supreme People's Assembly. At 31 years of age, he is the first North Korean leader born after the country's founding and the world's youngest head of state. 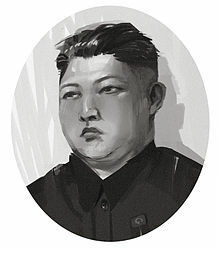 Kim was named the world's 46th most powerful person by the Forbes list of The World's Most Powerful People in 2013, the third highest among Koreans after Ban Ki-moon and Lee Kun-hee.